Plot Summary: The story, which was featured on the OPRAH WINFREY Show, CNN's AC360 with ANDERSON COOPER, the Dr. Phil Show, and other U.S. and international news media, not only depicts this powerful story, but also offers solutions to teachers, school administrators, parents, and teens on bullying. 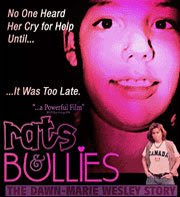 Documentary Film on Bullying "RATS and BULLIES"
Film Review: "Rats & Bullies" produced by Roberta McMillan and Ray Buffer probes the suicide of a 14-year-old girl from Mission, BC named Dawn-Marie Wesley, who took her own life by hanging herself with a dog leash in her bedroom after systematic bullying and threats by three teenage girls from her school. Her suicide was discovered by her then-13-year-old brother who had come to her room prior to the family's dinner, to use her TV. The bullies were named in Dawn-Marie's suicide note which prompted an investigation by RCMP and Crown Counsel leading to two precedent setting cases by Canada's provincial court in which the bullies were held accountable. Relational Aggression is discussed with a focus on female bullying. An added cultural component to the story is the role of aboriginal sentencing circles, which were utilized in sentencing one of the bullies, since the victim and one of the accused were both Native, or First nations. This form of Restorative Justice is beginning to gain wider appeal by legal systems around the globe.